The importance of having a good garden hose cannot be undermined by gardening aficionados. Going for the bigger sized option always seem to be the smart choice even when you have a moderately sized garden to cater to. However, you also need to understand that the longer models have the tendency of getting entangled to make watering tougher for you. They might even create a mess while lying around in the garden. This is where a garden hose reel comes in to the picture to make the whole thing easier. 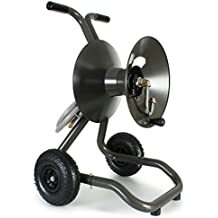 Today we are going to take a look at five best garden hose reel carts available in the market and the things to keep in mind while purchasing the same. Although you might have to pay comparatively more, it will definitely be worth the amount spent in the long run as you won’t be required to undertake frequent repairs. These garden tools are crafted using an array of materials such as PVC, nylon, synthetic or natural rubber and polyurethane. A hard wearing version can serve as your pick if you wish to use the tool on a daily basis by dragging it across stone or gravel. Since the reels are usually left outside, they need to be durable enough to withstand variations in weather throughout the year. Certain fixed or portable models are available in the market which encase the hose completely within a plastic structure to shield the same from weathering elements. Alternatively, you can opt for an open style reel if you store the same inside your garage or shed for being taken out only when required. You need to measure the size of your garden and correspondingly work out the furthest points from the water source or outside tap. If your water tap is at a fairly central tap, then you can save money by settling with a smaller hose. However, it becomes imperative to measure the garden length up until that point since most outside taps are on the wall. If you wish to save on energy while reeling or have a long garden to cater to, then retractable garden hose reels can serve as your ideal pick. These models work automatically by pulling up the length onto the reel and subsequently rolling it up. Although these models are extremely easy to use, they might require some strength on your part in the beginning. If you are thinking of carrying around your reel, then you need to opt for a lightweight one crafted using plastic and having an easy grip handle. While opting for a fixed model, you need to ensure that it attaches to the wall properly and the wall can sustain the tool’s weight. Most of the reels are accompanied by some basic accessories having fittings which need to be attached to the water outlet. However, you can invest further in a nozzle for starting and stopping the water flow. This becomes exceptionally useful if you wish to walk around the garden with your tool and switch it off before going back and turning off the water supply. Leaving water in your hose during frosty weather conditions can actually damage the garden tool as the water inside might freeze when the mercury drops. If you wish to strike the right balance in between portability and durability, then the Rapid Reel Model 1043-GH can serve as your ideal pick. Solid brass, cast aluminium and stainless steel which goes into its construction ensures that the garden hose reel surpasses your expectation in terms of its sturdiness. It’s “no leak, no rust, no brake” feature further adds to its lucrativeness making it a top pick amongst gardeners across the globe. Easy-mobility is guaranteed by its balanced design which gets further accentuated by a manufacturing warranty of 10 years. In stark contrast to a freestanding reel, you won’t be required to drill on your walls to complete the set up thus making it ideal for users who do not wish to tamper with their house decoration. 150 ft. of 5/8” hose can be supported by the reel which can be further accentuated up to 225 feet by using a 4” extension to expand the drum width. Weighing at only 33 pounds, these flat free tires surely rank high in the department of portability. You can thus easily reach the faucets to wash your vehicles, water your plants and complete other business or commercial activities coupled with the same. Once you are done cleaning your car or dampening the vegetation, you will just have to detach the inlet hose prior to storing the same inside your garage. Easy mobility is ensured by its two-wheel cart. Leak-proof model which comes with a 10-year warranty. A 6.5 x ⅝ inch polyurethane inlet hose is included in the package. Maximum durability is guaranteed by the die cast aluminium structure which escorts brass swivel. Rewinding and unwinding the hose is an extremely easy affair. Comes with solid tires crafted using lightweight resin material which won’t go flat or dry rot. Nozzle and hose needs to be purchased separately. Assembly is required prior to usage. The versatile two-wheeled hose cart by Liberty Garden Products feature properly welded hose fittings making its assembly a hassle-free affair. The Liberty 880-2 hose reel cart can cater to your requirements for long coupled with its durable powder coated finish and 13-gauge steel construction which doesn’t get lackluster even after braving adverse weather conditions throughout the year. Assembling the hose cart is an extremely easy affair as you can pump in air to its pneumatic tires coupled with a simple bicycle pump. You can even store additional hose garden attachments in the small basket at the back. You can exercise control over the condensation inside the tubing by constantly regulating the temperature in areas having less humidity. The dual 16-inch pneumatic tyres impart optimum maneuverability as you walk around your garden by holding on to its non-slip handle. It becomes easy to walk around the lawn as well go uphill coupled with its large wheels which is more advantageous in comparison to a 4-wheel configuration. Can hold up to 300 feet of a 5/8-inch hose. Durable powder coated finish make it perfect for being used throughout the year. Comes with a storage basket to keep frequently used tools. Added stability is provided by its low center of gravity to prevent the cart from tipping. 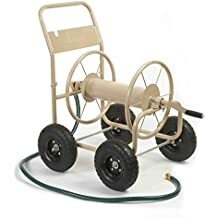 Cart does not move while rolling up the hose. Highly illustrated and easy to follow directions in the instruction manual makes assembly seem like child’s play. Hose has to be purchased separately. 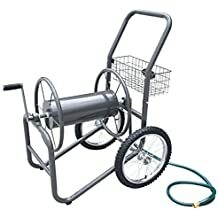 This multi-purpose hose reel cart which has been crafted using 13-gauge steel can be used for both commercial as well as domestic gardening needs. The durable steel construction coupled with its smooth reel helps in pulling out the tool in accordance to your desired length and wind it back correspondingly to save the trouble of manual intervention. Added protection is rendered against every weather element by its powder coated engineering which can be used with a 300ft long hose. 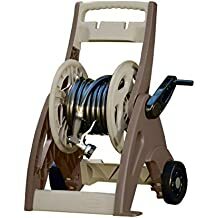 The accompanying user manual and instructional video make it extremely easy to set up the hose reel cart which can carry up to 300 ft. of 5/8” hose. The 90° brass swivel connector further adds to the lifespan of the hose by allowing the hose to swivel without getting damaged. The well-balanced cart wont tip over while travelling uphill or walking over rocky and undulating surface with the same. Its massive reach makes it the ideal choice for catering to both large grounds as well as smaller homes having multiple areas which require watering. 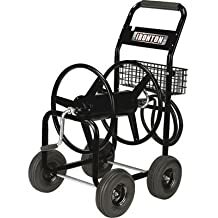 The non-slip handle of this cart can prevent its accidental slippage from your hand irrespective of the weather conditions while the four 10” pneumatic tires make it easily manoeuvrable and portable courtesy its low center of gravity. Kink free attachment is guaranteed by its 90° brass swivel connector. Tighter grip can be exercised by its no-slip handle. Versatile model having four 10-inch pneumatic tires to usher in greater mobility. Cart ranks high on durability courtesy its powder coated finish. The hose reel cart remains safeguarded from tipping by its low center of gravity. Durable powder coated finish makes it resistant to even the worst of weather conditions. Non-slip handle further adds to its portability. Highly expensive model which has to be assembled after purchasing the same. Cannot be mounted in one place. You can now create and maintain a beautiful house garden coupled with the Suncast hose reel cart which has been specially designed to usher in mammoth benefits. Its 2 ft., attachment hose can be used for connecting the faucet with your very own garden hose for serving both industrial and domestic usage. Its durable build can easily cater to a 175 ft. hose for reaching out every nook and corners of your garden. The unit is immune to heavy rainfall or scorching sun. It’s beautiful taupe and bronze combination will thus keep intact even if you use it tirelessly under the open sky. The dynamic hose reel cart comes pre-assembled thus adding to its functionality. You are bound to feel delighted by its wheels which assist in watering far off areas without facing any difficulty. This can thus serve as the ideal option for those who do not wish to store a hose reel in their house. You will just be required to disconnect the inlet tube after every use and wheel it back into storage. Watertight connection is ensured between the hoses and hose reel coupled with its Easylink system. End of the garden or leader hose is held in its place by the hose hooks. Highly portable hose reel cart which can be assembled easily by just fastening the short hose to the cart. Poorly constructed hose reel cart having vulnerable plastic reel housing. It is time to bid adieu to all chances of water leak coupled with the industrial grade hose reel cart from Ironton. 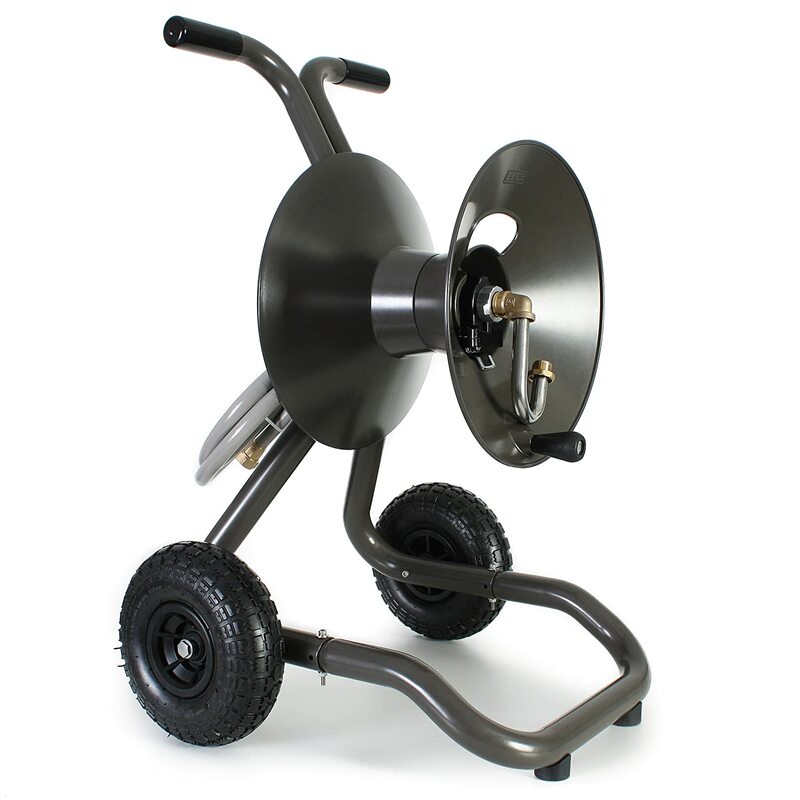 Solidly built hose reel cart ensures a snug fit in every single corner. The foam padded handles and strong tubular steel frame helps it is sustaining heavy duty usage without getting lacklustre. Can be assembled with a matter of few minutes coupled with the easy to follow instructions in the user manual. It is extremely easy to roll and unroll the hose without making any kink on the same as well as move it around seamlessly. Its 10 inch pneumatic tires and solid steel axes also impart greater mobility. Features an integrated basket for storing accessories. Comes with a 6-feet leader hose. Crafted with a durable tubular steel frame. Has to be assembled after delivery. Gardening can be a fun-filled activity provided you don’t struggle with the clean-up afterwards. Rolling up the garden hose is one such activity which can get messy making it imperative to seek out the assistance of a garden hose reel. And with a plethora of hose reels available in the market ranging from manual to automatic variants, taking the final call can prove to be a tasking affair. Users might even get confused about the durability and quality of their purchase. However, you are bound to have an upper hand while taking the purchase call coupled with our buyers’ guide and product recommendations.